Introduction to the series: an editor's forword (E. Padwa). Preface (R. Carbó-Dorca, P.G. Mezey). Quantum Molecular similarity measures: concepts, definitions, and applications to quantitative structure-property relationships (R. Carbó-Dorca et al.). Similarity of atoms in molecules (B.B.Stefanov, J. Cioslowski). Momentum-space similarity: some recent applications (P.T. Measures et al.). 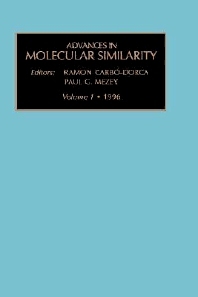 Molecular similarity measures of conformational changes and electron density deformations (P.G. Mezey) Electron correlation in allowed and forbidden pericyclic reactions from geminal expansion of pair densities. A similarity approach (R. Ponec). Conformational analysis from the viewpoint of molecular similarity (J.M. Olivia et al.). How similar are HF, MP2 and DFT charge distributions in the Cr (CO)6 complex? (M.Torrent et al.). Quantum molecular similarity measures (QMSM) and atomic shell (ASA) (P. Constans et al.) Automatic search for substructure similarity: canonial versus maximal matching; topological versus spatial matching (G. Sello, M. Termini). Using canonical matching to measure the similarity between molecules: the taxol and the combrestastine A1 case (G. Sello, M. Termini). New antibacterial drugs designed by molecular connectivity (J. Gálvez et al.). Index. The aim of this text is to provide reviews and monographs on topics involving molecular similarity, ranging from the fundamental physical properties underlying molecular behaviour to applications in industrially important fields such as pharmaceutical drug design and molecular engineering. The editors hope that this series will encourage new ideas and approaches, help to systematize the rapidly accumulating new chemical information, and make chemistry better understood and better applied.